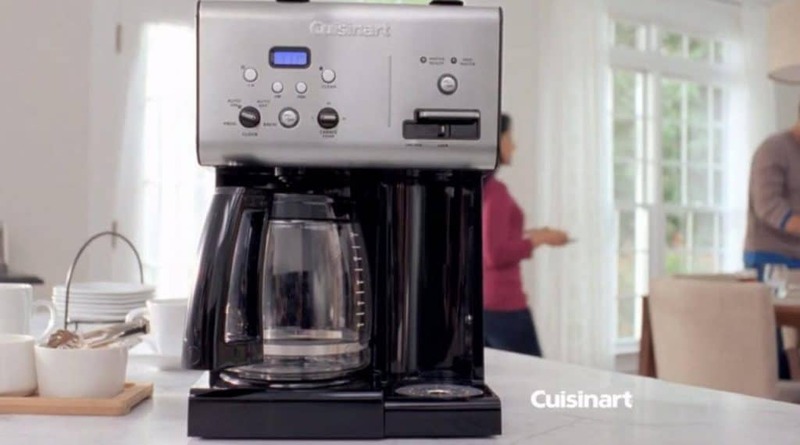 Home » Cuisinart Coffee Center Review: Should You Buy It? Cuisinart Coffee Center Review: Should You Buy It? If you’re checking out your options for coffee makers that can make a full pot of coffee or a single cup, read this Cuisinart Coffee Center review first. Take a look at the features, pros, cons, and how it stacks up against other options on the market. 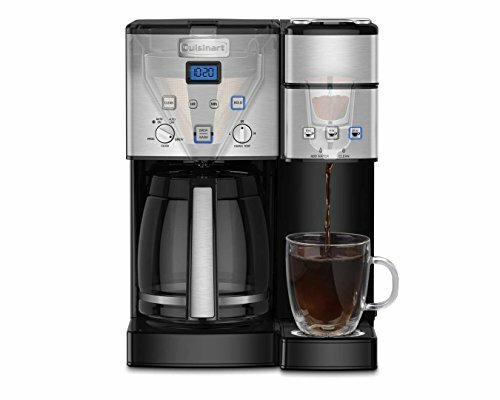 The Cuisinart Coffee Center can make a 12-cup carafe of coffee or a single cup of three, six, or 10 ounces of coffee. There’s even enough room to brew straight into a travel mug. It’s easy to use, automatic, and won’t take up an absurd amount of space on your counter. There’s a lot going on with the Cuisinart Coffee Center. The (glass) carafe with stainless steel handle is on one side and the single-serve area is on the other. Carafe’s temperature is adjustable (low, medium, and high). Charcoal water filter and gold coffee filter for the best taste possible. You can pause the brewing if you need your cup before it’s made the whole pot. You get the option to use paper filters on the carafe side if you prefer not to use the reusable filter. As mentioned above, you have a lot of choices when it comes to how much coffee to make, and there’s even a “Bold” button to make your cup of coffee have an even stronger flavor. Brew it into the carafe, your favorite mug, or straight into your to-go cup. It’s extremely versatile beyond the multiple cup sizes and the carafe. You can use K-Cup pods in it or choose your own favorite coffee. It even comes equipped with the Cuisinart HomeBarista™ Reusable Filter Cup so you won’t need to purchase anything extra to make your choice of coffee. This is a big plus over some of the other brands that use specific cups or pods and either won’t let you branch out, or require a separate filter purchase. There’s a removable drip tray where the travel mug goes. The coffee maker itself lets you know when it’s time to clean the machine. To clean the carafe, you’ll just need hot water and soap. You can even put the carafe (and lid) as well as the capsule holder on the other side in the dishwasher as long as you put them on the top rack. Use a clean, damp cloth on the heating plate and outside of the coffee maker. Descaling of all the internal parts of the machine just requires water, vinegar, and the push of couple of buttons. There’s no perfect coffee maker out there (well, probably not). You can get pretty close to perfect, though, if you think about what you want and need from your machine in a realistic way, what your budget looks like, and then measure all that against the pros and cons of a specific machine. From there, you can decide whether it’s time to make a purchase or keep moving and looking for a better fit. You can use any coffee you like in it or choose the K-Cup pods when you’re brewing a single cup. You don’t need to worry about BPA—it’s BPA-free. There are a lot of features in place to ensure the best-tasting cup of coffee possible, from the gold tone coffee filter to the charcoal water filter. You can get bolder coffee with the press of a button. You can make as much or as little coffee as you want. You don’t have to move the carafe out of the way when you just want to make a mug of coffee. Other options may have the ability to make more types of specialty drinks. There’s no milk frother or steamer, so you’ll have to buy a separate frother if you want to make cappuccinos and lattes at home. It’s a little pricey for what it does at just under $200.00 (sometimes just over $200.00 with tax, depending on where you shop). It wouldn’t be a fair Cuisinart Coffee Center review without comparing it to a few other models to see where it comes out on top and where it might be considered lacking. In this case, the most obvious win is the three-year warranty compared to all the others that only one year. The other place it’s a winner: the adjustable temperature option, which allows you to make your coffee hotter (great if you like to add cold milk, so it won’t get too cold right away) or cooler (perfect if you drink your coffee black and hate having to wait for it to cool off enough to drink it). 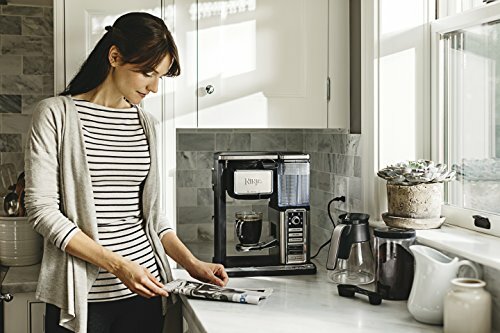 At first glance, it may seem like the Cuisinart Coffee Center takes a quick second place position compared to the Hamilton Beach model that does basically the same thing at a lower price. However, that removable reservoir can be a huge help and, depending on your preferences, may be worth the extra money. That said, only the reservoir on the single-serve side is removable. There are also more options for the single-serve amount you want to make. 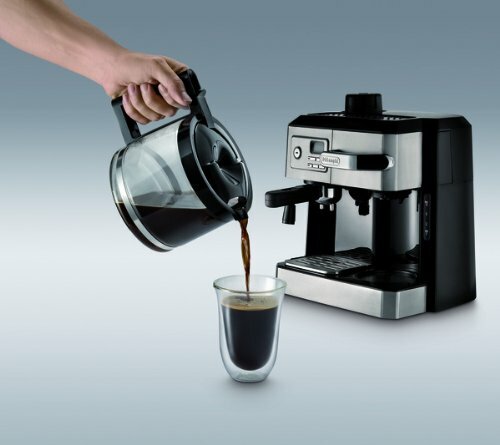 If you’re never going to just want espresso, go ahead and toss the De’Longhi model out as an option since its single cup options will involve espresso, not regular coffee. If you were hoping for an all-in-one machine and do enjoy making espresso and specialty drinks, it’s worth a look. For about the same price, you can have a machine that warms your cup, froths milk, and allows you to make actual espresso (not just concentrated drip-brew coffee). 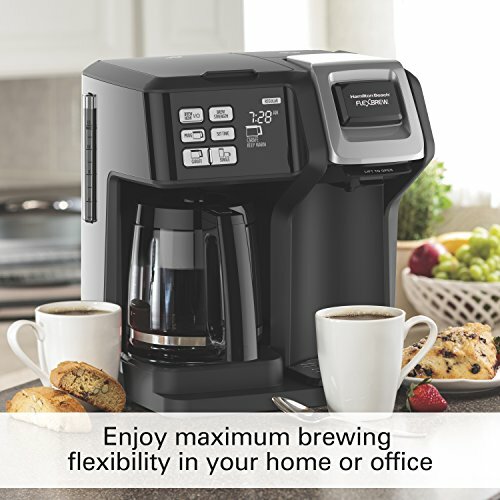 If you really want a great coffee machine that does it all, the Cuisinart Coffee Center definitely takes a back seat to the Ninja Coffee Bar System, which can make a full pot, half pot, and single-serve options in a lot of different sizes. There’s a milk frother for your convenience and enjoyment, but you’ll never feel obligated to use it. This machine could simply function as a coffee maker that can make several cups in a carafe or one single cup, straight into a mug. I think this is a fantastic option for someone who loves regular coffee and needs the option to make a single cup or a big pot, but it might not be the best option for someone who wants to easily and conveniently make specialty drinks that require frothing milk at home. There are definitely some options that make it stand out, like the dishwasher safe parts, long warranty, temperature control, adjustable coffee strength, and more. It just seems a bit expensive for what it’s able to do compared to other options on the market. All in all, the Cuisinart Coffee Center isn’t a no-go, but it’s not a no-brainer, either.